Technically, you don’t have to deal with them. What’s stopping you from selling your books on your own site? Well, the answer is “nothing really,” but you have to be a little crafty. One of the most obvious things you can do, is use sites like Smashwords, though you’ll still have to give up royalties. Second Warning: You lose your traffic and what you have built on Amazon’s platform. That being said, how many books does Amazon really help you sell? Most of the books that indie authors sell are from the indie author’s hard work, and self promotion. You don’t really need Amazon for that, but people are more likely to purchase from a major website like Amazon because of the guarantees and safety they offer. However, if your books are being pulled, censored, or not doing as well as you’d like, you may want to look into a few of these options. 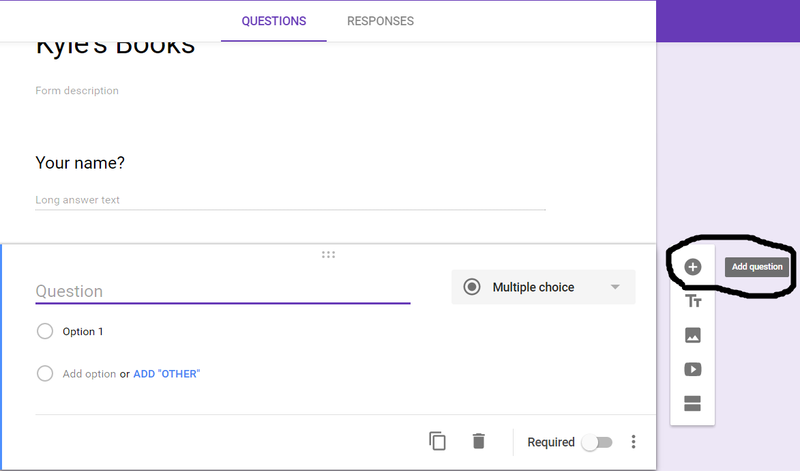 If you don’t know how to make a google form, it’s super easy. Start here. You should be prompted to sign into Gmail if you haven’t, and if you don’t have an account, create one. Select to start a new form. You’ll be met with this screen. You’ll need to title your form. Nothing too fancy, but if it has something to do with the books your customer will be purchasing, that would be smart. Okay, so now you have a spiffy new title for your form. Next, you’ll want to change “untitled question,” to something that you want to ask your customer. I usually start with their name. Then, where I have “short answer,” circled, click the dropdown and click “paragraph.” This gives them room to type out a response. All, in the bottom right, you’ll notice that “required,” switch. Click it so that the question is required for the customer to proceed. Now that you’ve finished that, you’ll want to add more questions. Do so by clicking where I’ve circled and just repeat the steps. You’ll want to know their kindle email, paypal email, how many books they want, how many copies, mailing address if it’s for a paperback etc. Finally, once you’re finished and everything looks good, you’ll want to click the responses tab. I have an arrow pointing at it in the picture. Then you will want to click the green icon. 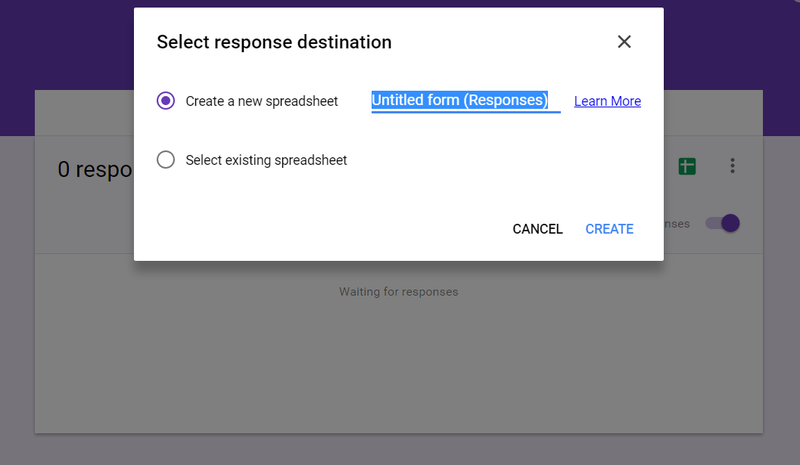 It will bring up the option to create a new spreadsheet. Name it whatever you want, again remembering that you might want it to have something to do with your book sales. 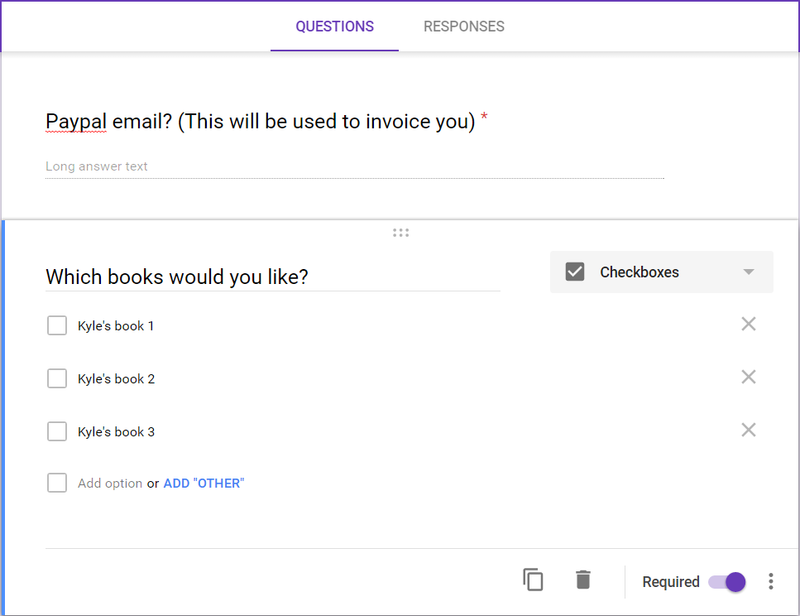 It will create a new spreadsheet, and when your customer fills out the form, this is where their responses go for your safe keeping, and so you know where to send the books, who to bill, etc. Bookmark the URL so you can check it throughout the day, and never give that url to anyone. Next, you want to go back to the previous page and hit send. 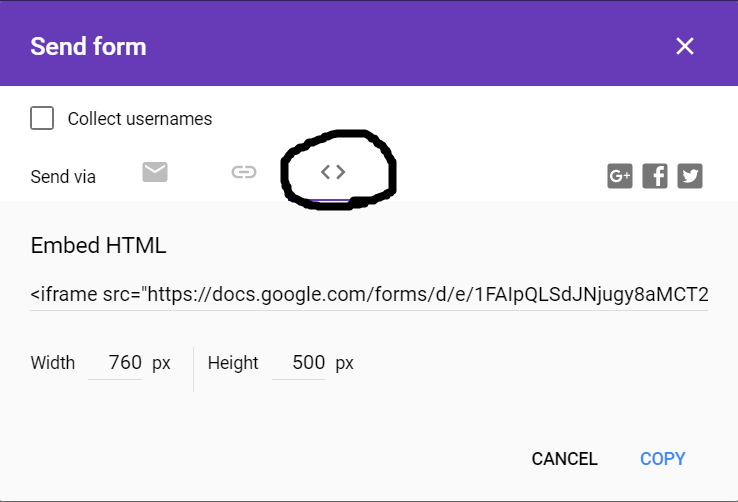 You want to click the circled option, then copy the entire line under “Embed HTML.” Adjust the width and height to fit your page. If it doesn’t you can come back and change it as many times as you need to. 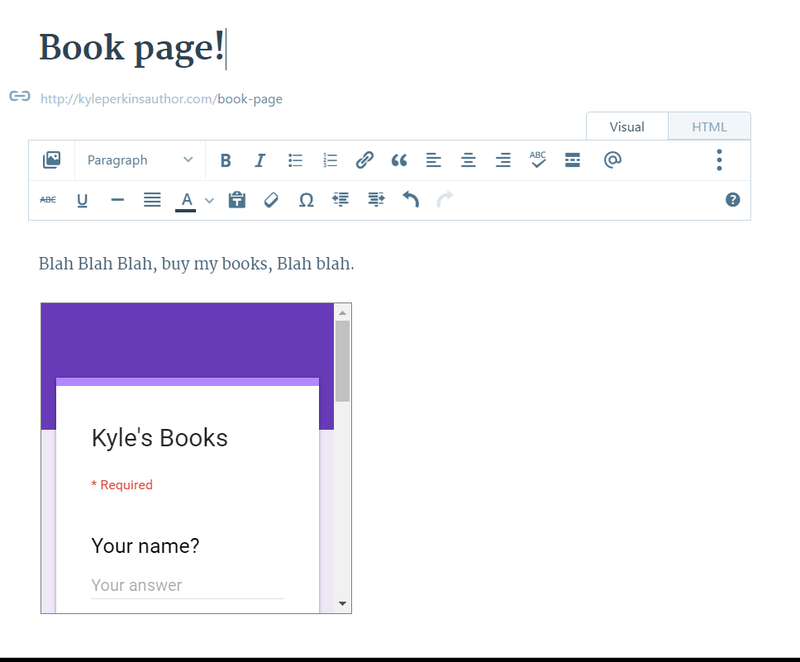 Go back to your wordpress(or any personal site you have), and add the HTML you just copied. 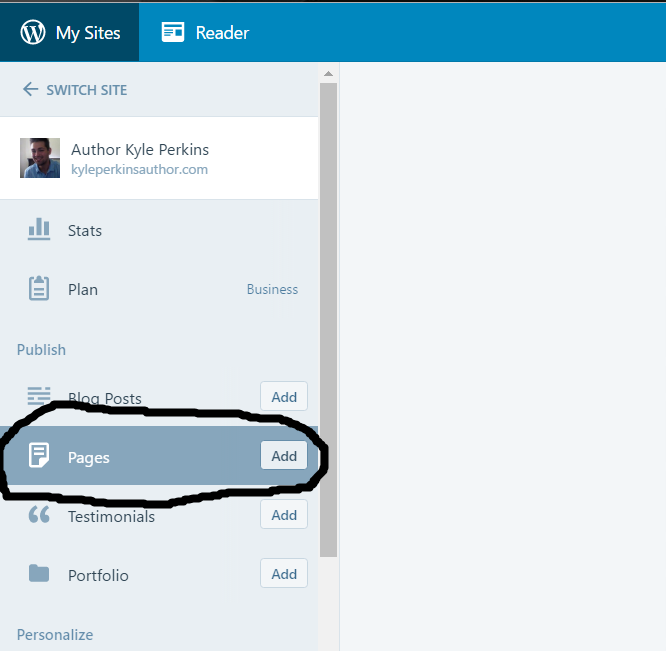 If you have a wordpress, just make a new page. Title it “Published work,” or “My Books,” etc. Make sure to click the HTML tab when the new page opens and paste it in. Then switch back over to the visual tab. Once it’s finished, it will look like this(Depending on how you customized it. 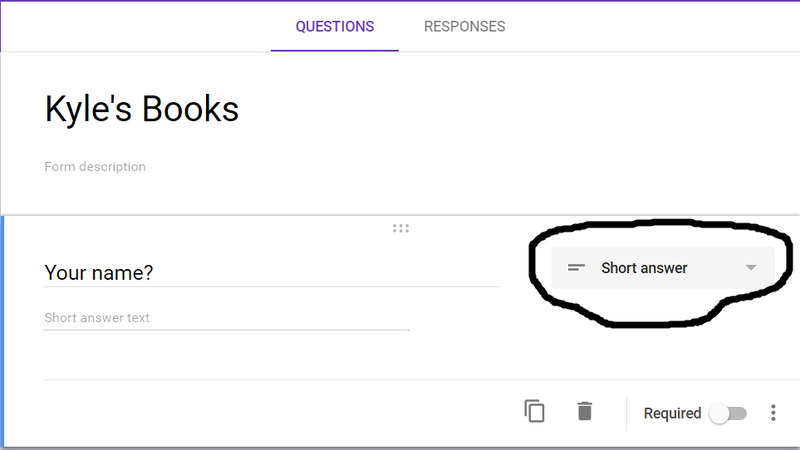 The little palette icon at the top right will allow you to customize how it looks on the forms page, where you create the questions). Now onto the next part. Another way to sell your books on your site. This will require you to have paypal and wordpress. Click here for all of the information you’ll need. You can use sites that host virtual stores for you. You are also at their mercy, but they only take around 1-3% typically from what you make, as opposed to Amazon’s insane take. However, once someone purchases your book, it can be sent to them by email in the format they want. Meaning, you open yourself up to piracy. (They can take your file and upload it onto a torrenting site). There are many sites like this, but this just happens to be the one I’m looking at right now. If you would like to find more virtual stores for your site, click here. As long as they have a way for you to plug it into your wordpress or website, or have html that you can put into a text widget(or in the HTML tab of any page or post like we did above) that brings you to their store, it will work. Just make sure that the store is reputable, offering good rates and safety for you and your product. Read reviews. The internet is a wonderful thing. Build your own wordpress using wordpress.org. This won’t be easy, and you’ll still have to pay for hosting elsewhere. Finding a host should be easy, once you know what you want to do. After you’re finished though, the site will be yours. Cons: You’re no longer in the wordpress stream. Meaning you don’t get the extra boost from wordpress themselves. You have to maintain the site, keep up the security, update your plugins, etc. They don’t do it for you. You will be a fish in a pond all by yourself. You’ll have to build yourself up. Pros: You can export your old wordpress or any site into wordpress.org. You’ll also have access to thousands of widgets and plugins that you can’t use with normal wordpress.com. Meaning there are plugins to sell your books, keep track of sales, offer refunds, your own TOS, send it in the format you want, to whichever type of email you want, and everything can be sent automatically and wirelessly, and in the case of paperback, it will create an invoice and keep track of what you have in stock. It’s freedom. You have to have patience, though. If you don’t have time to devote to this, or the technical know how, hire someone. This is your business after all. You want to do this right. There are many people online that would be willing to help you, including me. If you are short on time, go with one of the first methods I provided. They should be very easy to do, and you’ll be able to test out how much you can sell on your own, and reap 100% royalties. The call is yours, and I am not urging anyone to make any hasty decisions. Do your homework, research, and don’t even take my word for it. If you do want to give doing your own wordpress a try(not the free wordpress.com version, but the .org version), there are many resources available to you should you try and go it alone. This is definitely the place to start. 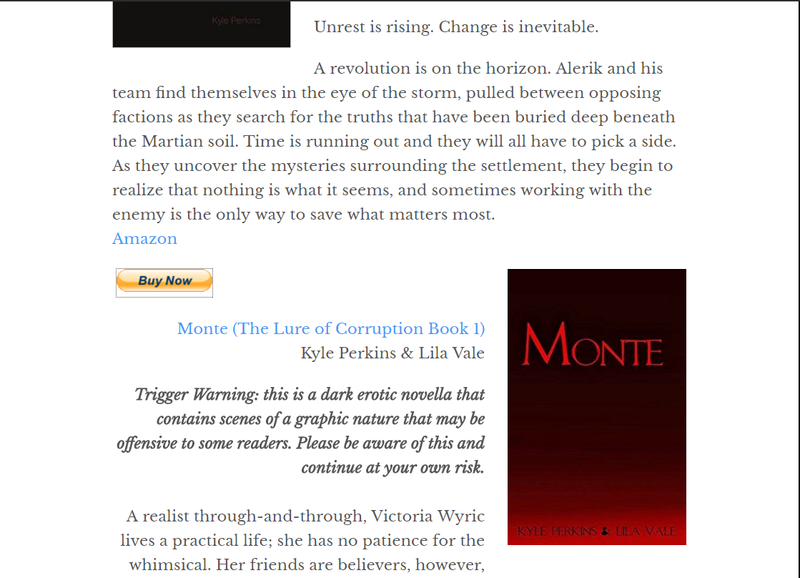 Kyle Perkins has provided some very useful instructions on how to sell books from your own site. Thank you, Kyle! I’ve sold only two books in two years on Amazon. It’s ridiculous. It wouldn’t bother me at all if they pulled mine, lol. Thanks for this info! I’ve been using Ganxy to sell direct. They have some great features, do all the math, and deliver the product. I like it a lot. 1. You’re a heckava better self promoter than I am. 2. You’re book’s cover and pitch aren’t properly positioning your book in its niche so that Amazon can find the people who want to buy it. I’m not ready for it but I really admire your kindness & generosity sharing and in this detail. This is a page I’ll have to come back to if I or the kids ever finish anything. Thank you! ← Bizarre Interviews with Kyle Perkins-Week 15.